Toshifumi of Scarlet Crusade US had the pleasure to PuG with a 700 DPS hunter. Well, since it was before the "you got 2 badges for boosting idiots" patch, actually it's your fault if you didn't check talents/gear. Tip: if you are in group with a low DPS hunter, check his aspect. Most of them are in Viper all the time. And another one! I know that every weapon is a hunter weapon, but 550 SP is a bit high for a hunter I'd say (by Miztickow). 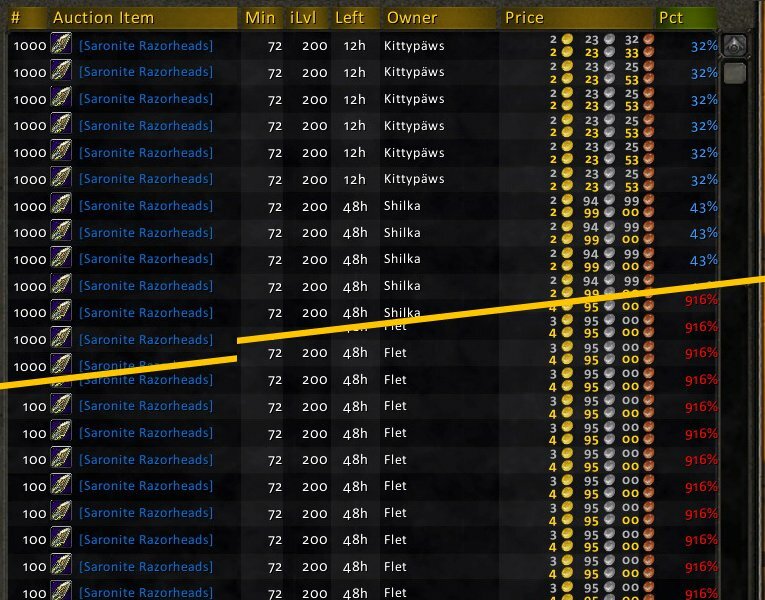 Flet of Hyjal(US) encountered a very unique way of being stupid: he couldn't sell 100 stacks of arrows because the other sellers undercut him and each other with their 1000 stacks! In the week when saronite prices skyrocketed! Instead of sending them a letter, he bought them out and relisted their wares. It increases his gear score! He is teh l33tz! GS = Skill! Yea not sure what's with all the hunter hate but lets use that noggin for a few moments. - A SV hunter has a long boss fight... in and out of viper as need to replenish the mana. - Force of habit turn viper on to replenish. I'm not saying that some hunters are next to useless and couldn't manage more than 1 mob at a time let along something as complicated as managing ones mana so in a moment of brilliance he activates Viper 24/7/365 and guess what?!?! No more mana issues FOREVER! Anyway just wanted to say hunters don't have the exclusive on idiot players. That I can attest to and so can most anyone else playing the game. The first year or two of playing WoW, my hunter (first toon) was my main. You would be surprised of the justified assumed stupidity. I never knew why as a hunter, because i would almost never group with another hunter ("2 hunters ... yuk"). But all it took was having the slightest understanding of necessary stats to stack, moves to use and mobs to shoot - and bam easy top dps even while trapping. The shock from other group members was often voiced: "Omg out dps'd by a huntard ... what could i have been doing so wrong". Since then, pugging on other toons (mostly as tank), i found roughly 10% of hunters i pugged with had any idea how to use their class. Soon learned never to enter an instance with them without seeing their gear slots - just looking for some clue that they know their class. 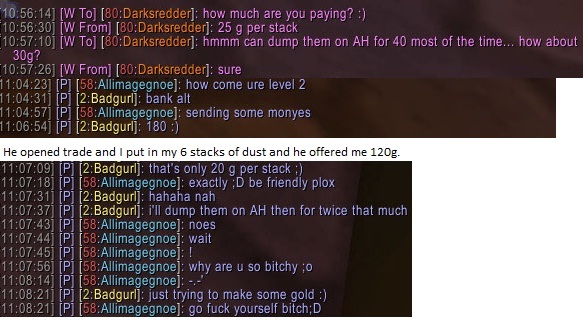 Hunters are not all bad. The class has a way of attracting the clueless players who cant even be bothered to conceptualise the usefulness of each type of stat. I love the :D at the end of the last pic. As if a smiley could excuse the one-two punch of insulting someone's intelligence by expecting them to accept ridiculously low prices and insulting them directly. If you think 550 sp is high for a hunter, check this out. Heh. Just today I ran with a 447 DPS Hunter in H Utgarde Pinnacle. Still was able to finish the job. DPS is overrated. Lupius, I think someone made that hunter on purpose. He's wearing all caster mail, with enchants that aren't too cheap. Just people trying to make fun of others IMHO. The hunter posted in blog maybe legit. His gear is terrible, and 550 sp is coming from a weapon with 550 sp. He may have just wanted to trade in a green he had. That item also has +hit, just saying his green may have been worse than that epic. You can't (currently) trust Recount/ dps meters in cross-server instances. For some reason, it doesn't count all damage done by players from other servers. It appears to be a range issue... characters not very close to each other don't get the correct information. There's a thread in the forums about it. As an aside, your last 'look atthis n00b warrior' has continued to take the upgrades he can get, and has since lost all his spell power, still has one tank piece but he's getting better. 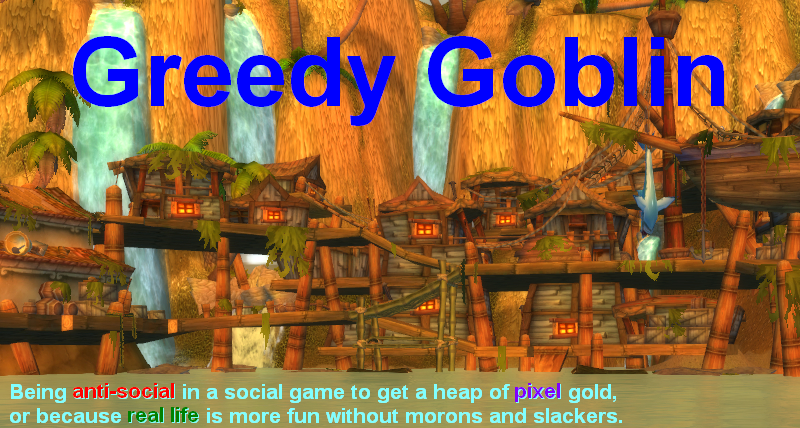 Ever wonder if your morons and slackers are just new players? my Word verification is "SUCKE"
The hunter with 550 SP now has a more normal profile. I suspect that he has a gear set for his BM spec and one for his SV spec, with the latter being heavy on spell power to add damage to Black Arrow and Explosive Shot. His spec and gear choices are definitely sub-optimal (2800 AP and 25% crit with a full set of epic gear?). But I can see the thinking behind some of it, and it indicates that he's tried to give some thought to his choices. He's the sort of player who could benefit tremendously from being pointed at a hunter forum or one of those 'best gear/spec' topics. He's more ignorant than he is moron or slacker, although he could also be M/S (if, for example, he reads EJ and decides that his own choices are the best). Ive ran almost full raids, chain heroics in Viper, as to not pull threat from tank (fresh 80 guildie), alot easier than having to feign, pop deterance, trap, or run. While yes I could "hold back" I good LnL and i will be WAY over tank threat. @LOLcayter, Yes on my server EVERYTHING is Gearscore.. I have seen people put on wepons or PvP gear just to get that 5K GS to get into ToGC... GS is retarded. SP doesnt helps those shots, alot of hunters used to stack SP to improve Arcane shot but that is no more. SP is worthless for hunters. You might be thinking of Spellpen which hunters will use for arenas, and at that you only need 75 Spell Pen.